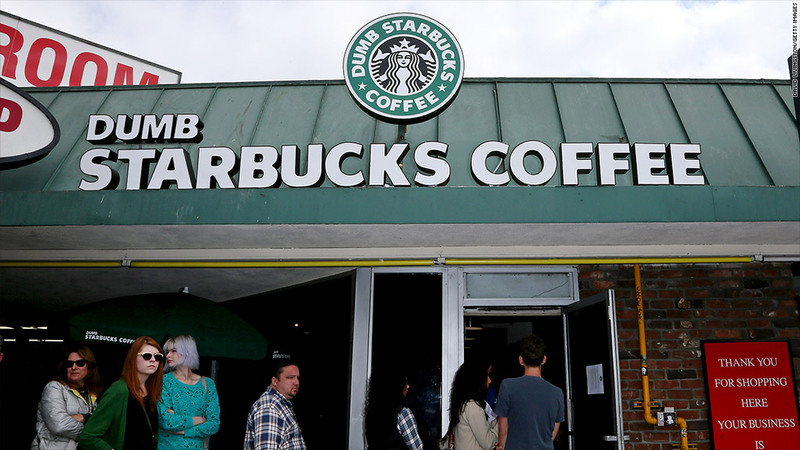 Los Angeles residents queued up for free coffee at Dumb Starbucks, and the real Starbucks isn't happy about it. The real Starbucks (SBUX) isn't happy with the parody coffee shop calling itself Dumb Starbucks that's popped up in Los Angeles, and wants the faux baristas to drop the act. "We appreciate the humor but they can't use our name," Starbucks spokesman Jim Olson told CNNMoney. "It's a protected trademark. It's our trademark." The shop called Dumb Starbucks opened its doors this weekend in L.A. and the baristas gave away free coffee until they ran out, according to news reports. Located in a strip mall next to a laundromat, the shop reportedly mimics the Starbucks menu, but places the word "dumb" in front of every product. At a late Monday news conference, the restaurateur behind the shop acknowledged it was a publicity stunt for a Comedy Central program. Starbucks responded, "We're glad the mystery is over." When asked earlier if Starbucks was considering suing Dumb Starbucks, Olson said, "We're evaluating our options." He also emphasized that the real Starbucks as "no affiliation whatsoever" with Dumb Starbucks. Founded in 1971, the Seattle-based Starbucks has a logo of a green-and-white mermaid wearing a crown with a five-pointed star. The Dumb Starbucks logo looks exactly the same, but with the addition of the word "dumb."